Do you like my view from the computer nook? We have a small landing at the top of the stairs, and that's where our computer desk is located. The landing overlooks the great room area of the house. This is one of the many reasons why we fell in love with this house - no matter what we're doing, we can be in the same room. It's wonderful, and it suits us quite well. Anyway, as I was sitting at the computer, I looked down and saw the most beautiful sight. The sun is cascading in through the large windows, and my whole little family is conked out down below. I just sat up here, listening to each one's unique breathing, and thought, "Man, life can't get much better than this. We are very blessed." Brian has the most comical Saturday custom. He gets up between 8 and 9, eats a bowl of sugary cereal, and then takes a nap. I laugh about it every time I stop to think about it. It's as if the eating of cereal is SO taxing that he must take a nap to recover. I always tease him about this, but you wanna know a little secret? I love it. You see, I'm a morning person. I accomplish more between the hours of 6 and 10 than I do the entire remainder of the day. In fact, I often think, "If I don't get it done by lunch time, I just might not get it done." After lunch, I tend to become more of a procrastinator. 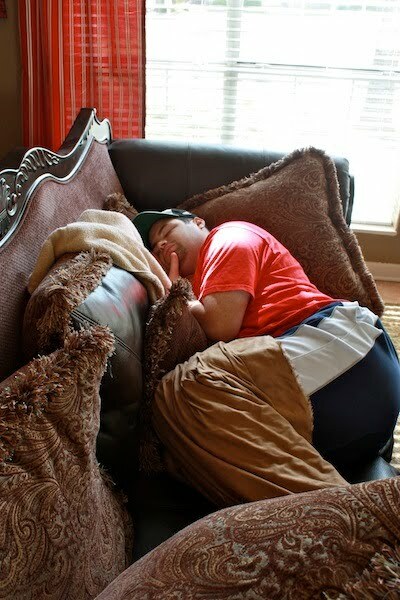 I usually get up before Brian and start doing a few things around the house. Saturdays are my catch-up days when I do laundry and clean and do yardwork. I'm a worker bee, so I don't mind this, at all. In fact, it's kind of therapeutic for me to know that the house will be clean and organized on Saturday. During the work week, we kind of just hold on for dear life, only doing the necessary chores to get us through the week. But, Saturdays are my deep clean days. I dust, clean the refrigerator, wipe off the window sills. You get the picture. When Brian takes his Saturday morning nap, the dogs always take their cue from him, and they pass out, too. See? Please note Gladys under the table. This dog works very hard to maneuver herself under this table, and then she guards her domain with all her life. Occasionally, she'll poke her head out if the situation warrants it, but she deems very few things as reasons for exit. This morning, I was able to get up before Brian and read through the Easter story in Matthew. Every time I read this story, I learn new things or pick up new tidbits of information that hadn't stuck in my brain before. Today, I was covered in chills at the thought of Jesus enduring such grief on my behalf. But, then my eyes began welling with tears as I recalled that He is NOT dead, but He is ALIVE in heaven! As I read this story, I couldn't help but relate my own suffering to that of Jesus. My prayer is always that I would be more like Him. That no lesson would be wasted on me, but that I would clearly see the message in every situation. Anyway, as I was reading, the recurring thought was this - He endured. He was humiliated, but He endured. He was isolated, but He endured. He was beaten up physically, emotionally, and socially - BUT, he endured. He was stripped bare, but He endured. You get the picture. Jesus Christ endured through every test and every trial and every struggle that came His way. He realized it was for God's glory, and not his own happiness. Thank you, God, for reminding me to endure today, because it is for your glory that I face trial. Teach me to suffer well for you. Happy Easter Lindsey. Be blessed as you watch this music video and are reminded of the precious, beautiful gift we've been given. "Oh what joy for those whose sins have been forgiven."